Super Bowl LIII has boiled down to the Los Angeles Rams squaring off against the “underdog” New England Patriots. The two teams last met in the big game in 2002 when the Patriots beat the then St. Louis Rams, 20-17. Fast forward 18 years and the Patriots have earned five total rings while the Rams have not been back to a Super Bowl since. To change things up and beat New England at a game it knows best, the Rams need to strike fast by getting on the scoreboard quickly, and by also getting to Tom Brady. At the same time, the Patriots defense will look to rattle the nerves of Jared Goff and his young offense. This leads us to share our stud and dud predictions for Super Bowl LIII. After touching the ball a measly five times in the NFC Championship Game, Gurley needs to be more involved on Super Bowl Sunday. 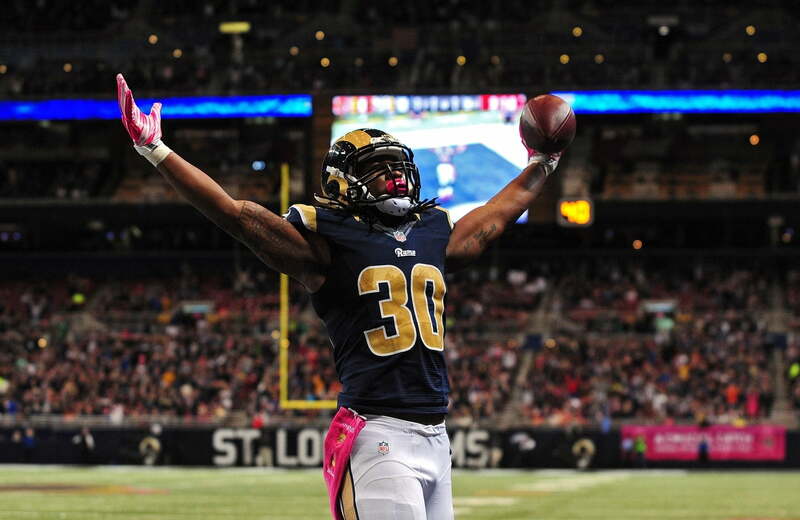 In particular, Gurley should be featured heavily in the Rams passing game. He will face a defense that last gave up 66 receiving yards and two touchdowns on five catches to Kansas City Chiefs running back, Damien Williams. We don’t anticipate seeing Gurley sitting on the bench or an exercise bike in big moments once again. Joyner has struggled at times this season. His Pro Football Focus grading dropped from second-best in 2017 to 28th for his position in 2018. Now for his final task on the campaign, Joyner will be attempting to limit All-Pro tight end, Rob Gronkowski. Postseason Gronk can be a force, and this was evident from some tremendous catches he last made against the Chiefs when he piled up 79 yards. On the other side of this, Joyner managed only three combined tackles in the Rams’ narrow overtime win against the Saints. Edelman has been scorching hot so far this postseason. Through his two games, he has managed to catch 70 percent of 23 targets for a total of 247 yards. On Sunday, look for him to continue being a target magnet. The Rams secondary is going to have to get up very early in the morning to attempt to outplay the this Super Bowl veteran. As such, Edelman should help put the recent smack talking by Rams cornerback Nickell Robey-Coleman to rest in this game. The Patriots defense has stepped up big time since the regular season ended. This could prove troublesome for Goff and his receivers. In the divisional playoff round and the AFC Championship Game, the Patriots allowed Philip Rivers and Patrick Mahomes to complete 49 and 52 percent of their passes, respectively. We can’t imagine the Patriots defense suddenly taking it easy against a young and inexperienced playoff quarterback in that of Goff. Speaking of the Patriots defense, Gilmore has been a stud all season, having recorded two interceptions and a career-high 20 defended passes in 2018. And as of late, Gilmore has really stepped up his coverage. According to Pro Football Focus, Gilmore has allowed only a 26.1 pass completion rate to opposing quarterbacks in his last four games. This is enough evidence to perhaps scare away Goff from tossing footballs his way. Michel has practically been unstoppable and has scored five postseason touchdowns. But, he stands to have some rain thrown on his parade by the Rams defense. The Rams last held the New Orleans Saints powerful running back duo of Alvin Kamara and Mark Ingram to a mere 46 combined rushing yards and zero touchdowns. Prior to this game, Dallas Cowboys star running back Ezekiel Elliott rushed for only 47 yards against the Rams. This could be game when pass-catching back James White once again lights it up. This Super Bowl game pits Donald against Brady, and the Rams’ interior pass rush could gain Los Angeles the upper hand. On the regular season, Brady took only 21 sacks. But, he will be facing Donald who had a beast of a season after tallying league-highs in 20.5 sacks and 25 tackles for a loss. Donald managed three quarterback hits on Drew Brees in the NFC Championship Game. Look for him to stir up plenty of havoc with a ring on the line. Expect Hightower to play a major role attempting to stop the Rams running backs. Many expect the aforementioned Todd Gurley to explode after being used so conservatively in his last game. If it is not Gurley wearing out Hightower on the ground, it could easily be C.J. Anderson giving him the slip into the end zone. Both running backs have combined for eight touchdowns in their last four games. Hightower will be in for a long game if this running back scoring pace continues.